Review in a Nutshell: Escaping From Houdini is a fantastic instalment in an amazing series, and you will be dying to read more. 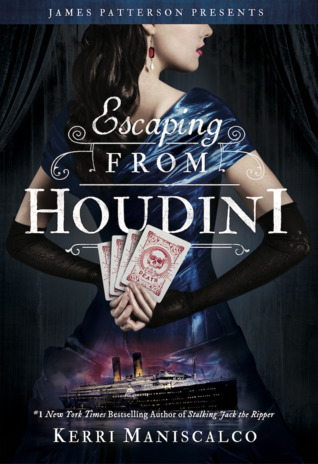 Escaping From Houdini is book three in the Stalking Jack the Ripper series, following Audrey Rose Wadsworth as she travels on a luxury cruise liner to America. When bodies start appearing in gruesome and theatrical ways, Audrey must investigate the carnival on the cruise to try to decipher these murders. This book has such an interesting setting! Set on a ship in the Atlantic Ocean during the 19th century, there is an added level of creepiness and urgency in the book, for all the passengers are trapped for a week with a murderer. The carnival aspect of the setting also added a fun and unique twist on the creepy murder mysteries we’re used to. Kerri Maniscalco writes beautifully. Her prose is elegant and gruesome, and her dialogue is witty and sharp as a knife. One of my favorite parts of her books is the dialogue between Audrey Rose and Thomas, and this book just added another amazingly clever character with Mephistopheles. Whenever the three of them were together I was never disappointed by the entertaining quips they would come up with. This is where I got most annoyed. First, the character who can do no wrong in my point of view: Thomas Cresswell. I love him so much. He’s still the flirty genius as he always was, but you really get to see more of his vulnerabilities in this book and that made me so happy. However, he doesn’t get as much time on the pages as I would have liked. Now onto Audrey Rose. Audrey bothered me a bit in this book. She’s still as intelligent and independent as always, but she definitely made some frustrating decisions that, while not completely out of character, really bothered me. I just didn’t feel like her decisions were worth the little bit of development they gave her character. There was a new character in this book who definitely demands attention, and that is the carnival ringleader, Mephistopheles. I really enjoyed unravelling his mysteries and seeing him interact with the other characters. By the end, I was really fond of him. However, with his character comes an unnecessary love triangle that I did not enjoy at all. While I can understand some part of it, I just felt it only existed to add some drama and keep Audrey Rose and Thomas from getting too comfortable in their relationship. Escaping From Houdini is a magical mystery is sure to stop your heart.